Join a tightly curated group of 10 successful business leaders for an epic journey that combines Machu Picchu, Ayahuasca, and a business mastermind in the heart of Peru’s Sacred Valley. Have you wanted to experience the benefits of Ayahuasca for awhile, but you want to be sure to do it right? Or maybe you have attended a few weekend retreats, realize that you just scratched the surface, and now you are ready to go much deeper. See Michael’s recent interview with Fast Company. You appreciate the success you have achieved, and now it’s success combined with a positive impact that inspires you. You realize that the approach, beliefs, motivators and mindsets that got you to where you are today will not get you where you want to go next. You’re ready to let go of the emotional triggers, reactive behaviors, and destructive habits that have been slowing you down. You realize that you don’t know what you don’t know, and the insights you seek are hidden in your blind spots. You are curious about enlightenment, spiritual awakening, and new approaches to realizing higher states of consciousness. You understand the value of a tightly curated mastermind program and a high trust business network. You know how to leverage your insights, network, and get that this mastermind will be a springboard at least as impactful as Summit at Sea, or even Date With Destiny. If this sounds like you, then we wholeheartedly invite you to apply to join our next program! Many apply, only 10 will be selected. The Machu Picchu Ayahuasca Mastermind is designed for entrepreneurial business leaders who realise, (especially after Trump’s election), that there is no time to waste. Participants want to become the best they can be and are ready to take a quantum leap forward in their personal and professional lives. What it is: A 10-week mastermind program that includes a 10-night adventure travel in the Machu Picchu area of Peru. The program is equal parts business mastermind, personal transformation program, and epic adventure. We stay at inspiring hotels, eat incredible food, and visit epic locations, including Machu Picchu at sunrise. With 5 years experience and over 50 graduates, all aspects of your privacy, safety, and personal needs are artfully attended to throughout the program. Why business leaders choose us: Sure, you could go to Peru with a buddy, the same way you could go to Mt. Everest. You can do it on your own and have an epic adventure, likely making it to base camp. But to summit the mountain — to reach what you REALLY want, to survive the extremities and unknowns and to navigate the inevitable surprises — it would be ridiculous to make the journey without hiring an expert guide. For the same reasons, our clients choose us to guide them on their Ayahuasca journey — before, during and after. Our program is exclusive – 10 participants are chosen from an applicant pool, enabling us to curate the most powerful group possible. Our program is private – each participant understanding the need to protect each other’s reputation. Our program is secular – free of any one spiritual agenda. Our program is legal – Ayahuasca is legal in Peru. Our program is based on executive coaching and cutting edge therapeutic techniques, not new age spirituality. Our program is located in the Andes, near Machu Picchu, away from the Malaria, Zica, and parasites. Our program delivers business ROI – Many graduates find the mastermind results alone worth more than the cost of the program. Our program is predictably safe. Our Peruvian team has worked with us since 2012. The Machu Picchu Ayahuasca Mastermind is the only Ayahuasca program that was specifically designed to resolve the unique psycho-emotional blocks holding entrepreneurial business leaders back from realising their full potential. The 2019 programs will be co-lead by EA Founder Michael Costuros, pioneering psychologist Isaac Meadow, and Ayahuasquero Javier Regueiro. Michael Costuros. The 2019 programs will be co-lead by EA Founder Michael Costuros, pioneering psychologist Isaac Meadow, and Ayahuasquero Javier Regueiro. 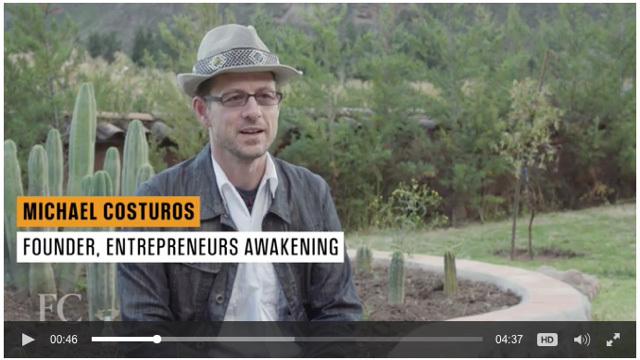 Michael has lead the Peru programs since 2012, artfully guiding over 50 entrepreneurs through their awakening process. He will be focusing on the mastermind and executive coaching aspects of the program. Isaac Meadow. Isaac has co-led two previous Peru programs with Michael. A pioneer in prep and integration processes for intense psychedelic experiences, Isaac has supported the prep and integration process for more than 100 clients who choose to use psychedelics to trigger profound awakening experiences. Isaac will be focusing on the 1-to-1 psychological preparation and integration process each participant enjoys. Learn more about Isaac here. Javier Regueiro. Before launching the first Machu Picchu Ayahuasca Mastermind, Michael spent 5 consecutive months in Peru drinking Ayahuasca with more than a dozen Ayahuasqueros in search of the one that would be perfect for entrepreneurs. Javier conducts his ceremonies in the traditional Peruvian mestizo style and limits his groups to 10 people so that he can deliver focused 1-to-1 support to each participant. Javier works out of his center in Peru exclusively and has been 100% focused on leading Ayahuasca ceremonies for the last 8 years, conducting more than 100 ceremonies per year. Not long ago Javier published Ayahuasca: Soul Medicine of the Amazon Jungle: A Comprehensive and Practical Guide which has become the book many Ayahuasqueros recommend to people new to Ayahuasca. You learn that a mission-critical initiative is at risk due to a mistake made by your direct report. You take a deep breath, let go your frustration, and reach out to them with a constructive, solution-oriented attitude. In a meeting where you are presented with new opportunities, your inner voice is clear which is the right path, you have no problem saying no even in the face of fierce opposition. In a moment of clarity, you realise how much you appreciate a colleague. Without hesitation, you call them up and express your feelings in a way that truly inspires them and strengthens your relationship. A direct report who has not performed to your expectations for months makes another bad judgment call. Instead of reprimanding, you are inspired to take a half hour to mentor and empower them to make better choices in the future. Returning to the office the week after your retreat, you feel lighter and notice yourself smiling easily. It’s as if a hundred pound boulder has been removed from your shoulders. Your colleagues and friends comment on how great you seem. Opening the refrigerator, the unhealthy beverages and snacks no longer appeal to you. Instead, you opt for a banana and big glass of water. You notice the frustration of a lingering resentment you have been holding toward someone. You simply choose to call them and get it resolved immediately. Membership into a carefully curated mastermind group of 10 entrepreneurs who will substantially increase the value of your business network. 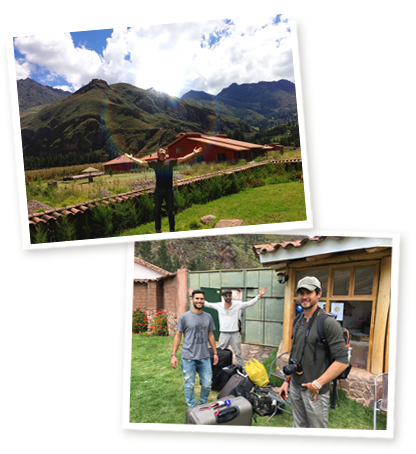 1 month of individual and group preparation coaching leading up to Peru, including packing lists, logistical support, as well as Ayahuasca preparation. Visits to the ruins of Saqsaywaman, Ollantaytambo, and the hidden cave ruins of Naupa Iglesia. 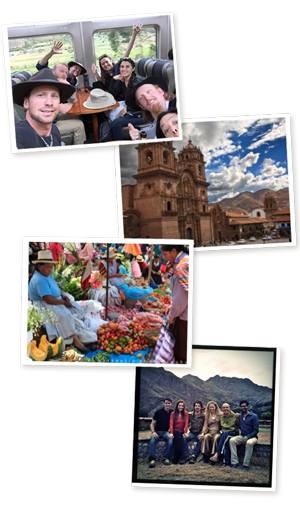 You will also explore the historic district of Cuzco, the native crafts town of Pisac, and get up close and personal with giant condors at a rehab sanctuary. 3 ceremonies led by a traditionally-trained, globally respected Ayahuasquero and author Javier Regueiro. Javier is THE BEST and has facilitated all of our ceremonies since 2012. Oh, yea, and Machu Picchu at sunrise! Luxury boutique hotels, including InkaTerra Machu Picchu and Casa Cartagena Cuzco. Enjoy both healthy, and unhealthy (yum!) gourmet food throughout the trip. (You will come back with an expanded palate and yet more fit than you arrived!). A month of integration coaching support after returning from Peru, ensuring that you integrate your insights into your personal and professional life. Group mastermind exercises designed to jump your most pressing business opportunities forward. Inclusion into our private LinkedIn network of EA retreat alumni. The next Machu Picchu Ayahuasca is not yet scheduled, apply not to receive an invite. Each program is limited to 10 people. Final participants are chosen months before the program starts, so apply now. Many apply, only 10 will be selected. Apply now for the 2019 Machu Picchu Medicine Programs.